Sept. 30 - Music replaces gunfire on the streets of Kabul as the city prepares for a one-day music festival - the first of its kind for decades in Afghanistan. Rough Cut (no reporter narration). Nov. 14 - Investors are overly fixated on keeping Italian yields below 7 pct, says Mizuho Corporate Bank's Nicole Elliott, who argues that emerging market bonds prove there's nothing magical about that level. Nov. 10 - Mexican social media boom draws drug cartel attacks, as fourth victim is found dead with threatening message. Nick Rowlands reports. Why Is There a Euro Crisis? On Thursday, October 28, 2011, prices of European stocks soared. Big banks like Société Générale (+22.54%), BNP Paribas (+19.92%), Commerzbank (+16.49%) or Deutsche Bank (+15.35%) experienced fantastic one-day gains. What happened? The 2011 Wolfson College Syme Lecture was given by Denis Feeney, Giger Professor of Latin and Professor of Classics, Princeton University. The speaker is introduced by College President Prof. Hermione Lee. The Student Government Association organized a freeze mob to raise awareness of campus organizations and to promote school spirit. IPL: Christina Hulbe "West Antarctic building blocks"
Professor Christina Hulbe gave her Inaugural Professorial Lecture on the 1st of September 2015. She talked about her work on mapping deformations in West Antarctica, and how GPS technology has changed her work. Satellite imagery of meltwater ponds has led to a clearer understanding of the creation of deep crevasses and shattering of icesheets. 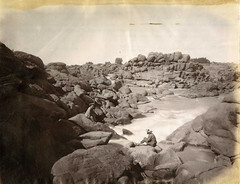 Description: Photograph of Ki Ki Rapids of The Hundred Falls, Orange River.' Author of work: Lulu Farini. Situated on the Danube River, Vienna, Austria, is both cosmopolitan and mindful of a regal history. Gothic styled St. Stephen's Cathedral holds a central position in the downtown area, that maintained its Renaissance style. This 1:15 minute video reviews the highlights of this city. Conférence co-organisée par le master Management du sport et la Bibliothèque universitaire sciences-STAPS, le 22 mars 2013. Nov. 9 - Paris department store Galeries Lafayette turns on its "rocking" Christmas displays. Tara Cleary reports.